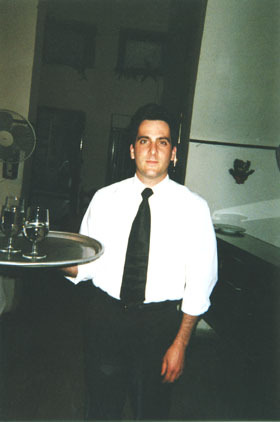 When I arrived in San Francisco in the fall of 1999 I took a job in a restaurant as a busboy. Prior to my arrival in San Francisco I had been working as a cabinetmaker in Boston for three years. Since I was going to school full time during the day I was unable to find a cabinet shop that would allow me to work nights. Thus, I started working in restaurants. My first body of work dealt with furniture and cabinets (as shown in up coming pictures), but slowly my “research” as a busboy started to infiltrate my pieces. I began to either perform or interact with people postured as a service person, busboy, or attendant. I was usually a silent, sculptural element in those installations, interventions or performances. The Service Series (as seen in the images below) was my attempt to deconstruct the persona that I was adopting those performance pieces by investigating the uniform that I would were: black shoes, black socks, black pants, black belt, white shirt, black tie and (sometimes) black bag.